These are the two quickest and easiest ways to get spray paint off your fingers, hands or any other skin using products you already have in your home. Do you sometimes need to get spray paint off of your skin? It seems like every time I do a spray painting project, even if it’s something quick, I get a little bit on my fingers. Or a lot on my fingers. And it doesn’t just rinse off in a jiffy like regular paint either, does it? Noooooo. It just can’t be that easy! I used to scrub and scrub and scrub or just wait a few days for the paint to wear off when I ended up with hands (Or legs if it was shorts season and I was really getting into it!) that looked like this picture below. So there are two things that you can do to solve this quickly! Nail polish remover! It works! I have to admit that I’m not really too excited about putting nail polish remover all over my skin, but for the odd drip or drop it really is the fastest way to get that paint off! If you have a little bit more spray paint mess to deal with, the second best method to get rid of it is non-stick cooking spray! Just spray it on, rub it in, and then wash it away with soap and water. It really melts the paint right off! The next time you get spray paint on your hands, I hope this makes your world just a little bit less frustrating! How to Get Spray Painted Projects to Dry Almost Instantly! Excellent tip! I also learned that you never try to wipe the wet paint off, it just smears it and makes it harder to get off in the end. The more solid the glob of paint the easier it comes off all at one time. Sorry if that was too technical! 😛 Thanks for sharing another great idea! I found that if you rub in hand sanitizer, and give it a few seconds to work, it really works great ! Just wash your hands off with hot water and your favorite hand cleaner ! That’s a great one! It makes sense because of all of the alcohol in hand sanitizer. Thanks for sharing that tip, Barry! I love how practical your tips always are. Yes, I can never get the spray paint off of my fingers either. Gonna have to try the cooking spray next time. So glad you like my tips, Emily! 🙂 I do feel like I cheat a little bit because I really just share whatever I’m doing in my real life that I think other people might find useful. 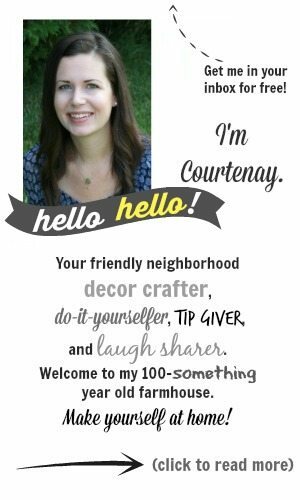 I almost never do any little projects or tips just for the sake of the blog. It seems to work though, so I guess other people are just working on the same stuff in their homes that I am and that’s what makes them so practical! Thanks so much for stopping in and saying hi today! Thanks so much for these tips! I have had many spray paint manicures. Hehehehehe. 🙂 They’re all the rage these days! Another thing that helps keep the paint from sticking on hands is to use hand lotion before beginning a project. Doesn’t keep it all off but the clean up is easier. Oooo! That’s a great tip, Joan! I love that one! Ironic, I just got paint on my finger. THANKS FOR THE TIP. I’m going to have to try the cooking spray next time, ’cause you know there will be a next time and it quite possibly will be tomorrow. Thanks for yet another great tip. My daughter does spray paint in garage and comes in covered in it. Nail polish remover didn’t do much but Walmart/Equate facial towlettes (Compare to Ponds) do a decent job but it takes a lot of them. Definitely trying the cooking spray next time. She comes in with her feet & hands covered. Thanks for the tips, try using non stick cooking spray to remove sticky glue from glass bottles, it really works! 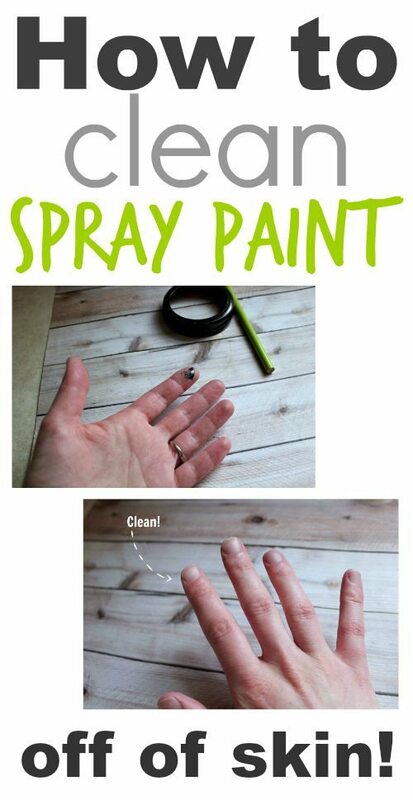 Thanks for sharing this tip, I used spray paint just the other day and had a really hard time getting it off my fingers and some paint accidentally got on my porch. Great tip and something I always have on hand. Spray sunscreen works really great. Spray it on generously, let it sit a few minutes and wipe off with s soft rag. I found out this was also useful for getting pine sap off of skin also. I hope this helps. I use fitted disposable gloves, the really stretchy kind that are used in food and medical industry (I have found them in both the area of the grocery store where cleaning and food storage supplies are, like plastic wrap and foil, and in the pharmacy area). I found that loose fitting gloves aren’t good because if there is extra “glove” hanging at the end of your finger, it can interfere with the paint spray coming out of the nozzle and make it spatter. I also keep an old version no sleeve button front shirt hand to put on when I spray paint to protect my clothes and my arms. Don’t forget a mask and eye protection as well. I do appreciate your tips for those times when I get in a hurry or somehow get paint on me despite my best efforts. Thanks for your helpful tip that I did not have to rub my hands to wash some bizarre paint. Excellent article. Sometimes it is very difficult to clean your hands of paint. I usually use a paint thinner to clean my hands. Chemical solvents of paints can cause serious irritation and damage to the skin, so instead of relying on these powerful tools, it is better to use something more “healthier”. Personally, I sometimes use oils (vegetable oil) to clean my hands. In addition to sunflower oil, you can try olive oil, coconut oil and non-food oils, for example, baby oil. Then you just need to “wash” the paint off your hands and rinse with water. But you should avoid aggressive oils, such as turpentine. Never use caustic oils on the face or neck skin! Love your tips, but using cooking spray to clean off paint makes you wonder what exactly is in it and should you be ingesting it. Haha, I do wonder about a lot of convenience products like that, it’s true. You can definitely use something like straight olive oil as well, but the cooking spray does seem to work a little more quickly for some reason.